Invisible Keyloger offers the most powerful stealth performance. Completely undetectable to any USER Invisible Keylogger will monitor and record information with no possibility of being detected! Have you tried other products that are easy to detect? We are sure you have but with Invisible Keylogger there is no need to worry anymore! Our application is completely undetectable! Smart Keylogger is an advanced version of (Invisible Keylogger). Smart Keylogger offers you the ability to remotely install the keylogger application in complete stealth mode undetectable by the user. You do not need physical access to a computer to install Smart Keyloger. Smart Keylogger was designed for parents who need to monitor their children remotely, or anyone who needs the ability to remotely install the application without it being detected by the email recipient. Remote Installation - Smart Keylogger comes with a Remote Installer Wizard where you can send the installer combined with any EXE file or Game. The remote installer will install the keylogger software in complete stealth and can automatically remove all traces of itself after install! Completely Stealth - Configure Smart Keylogger to hide during monitoring sessions and it is virtually impossible to detect. Smart Keylogger will not be listed in the task manager and also gives you the option to remove it from the uninstall list! Superior stealth performance that is unmatched by others! Windows Startup - Configure Smart Keylogger to startup for a single user, or to start up as a service for all users on the system - perfect for monitoring multiple users of a PC if you have access to install the keylogger. Automatic Startup - Automatically begin recording immediately all users no matter if they are password protected! Upon windows startup Smart Keylogger will capture all information from the users you intend to monitor. 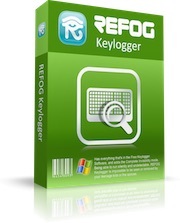 Intuitive Interface - Invisible Keylogger (Remote) has a very intuitive and friendly user interface. All functions are self explanatory and actions can be easily executed with a click of the mouse from novice to professional it's simple to use. SMART KEYLOGGER CAN BE COMBINED WITH GAMES - EXECUTABLES - ETC!